While House Sparrows may or may not be the most loved birds, they certainly are a part of our backyard bird watching experience. Initially these birds were imported from England. Brought to the US because they were known to eat certain caterpillars that harm shade trees. One by one, other US cities began importing them for the same purpose. In less than 50 years this small bird has a range that includes the entire U.S. and well into Canada. Unfortunately, they didn't go after the caterpillars hoped for. While intentions were good, the outcome has been just the opposite. Our native cavity nesters have not evolved fast enough to compete with these highly competitive birds. Their nesting, feeding, and mating habits can be observed easily due to their long multiple breeding season. 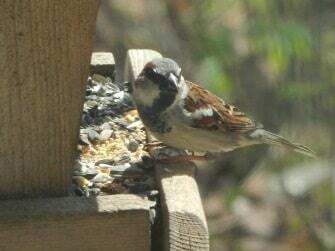 House Sparrows are 5 to 6 inches in length. The male has a gray crown, whitish check, and black throat. The bill and breast are black in summer and in winter the bill is yellow and the breast is gray. The female has a brown crown and a plain breast with a broad buff line over the eye. 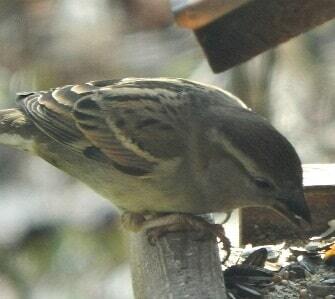 Be careful when identifying female House Sparrows because they may look similar to female House Finches. The female House Finch will have a stripped breast. Although misnamed English Sparrow, and commonly known as the House Sparrow, it is not particularly a native of England and is not a sparrow. It's thought to have its origin in the Mediterranean and actually a member of the Weaver Finch family. The mating habits or courtship behavior of the House Sparrow can begin as early as January and continue through July. The males claim their nest sites and defend its immediate territory. There is no defined area outside the nest that the bird defends. The male chirps by the nest site trying to attract a female. When a female comes by, the male chirps louder and more quickly. Sometimes the male will follow the female a short distance and hop or wing quiver around her if she passes by him. Other males may join in trying to attract the same female. Mating occurs throughout the breeding cycle, (March through early August) near the nest site, and may occur several times during the day. Once the birds pair, nesting begins. These birds are monogamous, usually for life. Although lost mates are quickly replaced during the breeding season. 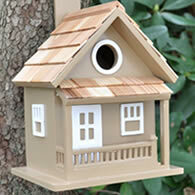 The nesting habits of House Sparrows plays a significate role in the birds life and activities. Since these birds use the nest nearly year around. In spring and summer the birds use the nest for raising young, up to four broods a season will be raised. In fall and winter it is used for resting in the day and roosting at night. The nest can be located in any available place in buildings, trees, and birdhouses near human habitation. The adaptability and the number of broods raised is what causes this birds numbers to multiply. The nest building is done almost year around. 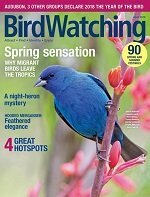 You are likely to notice most nest building activity in spring and fall. The main one is in spring just before breeding. Both the male and female build the nest. The nest is spherical in shape, 8 to 10 inches in outside diameter and is made of coarse material on the outside such as, straw, twigs, paper, leaves, grasses, and any other available material. The inside is lined with feathers or fine grasses. The female begins laying eggs about a week after nest building begins. Typically 4 eggs are laid but some nest can have up to 7 eggs. The eggs are white to dull brown and speckled with brown. For the most part, incubation of the eggs is done by the female. Incubation last for about 12 days and the young leave the nest in 15 to 17 days after hatching. Both the male and female feed the young. After the young birds have fledged, the male continues feeding the fledglings while the female begins the next brood. Their diet consist mainly of small seeds. They can be attracted to corn, oats, wheat, and other types of grain or weed seeds. The birds primarily forage on the ground. 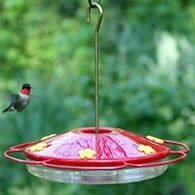 During spring and summer when feeding nestlings, the birds will switch their feeding habits to insects and spiders. They readily eat scraps of food and bird seed provided by humans. 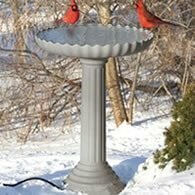 These birds can be very aggresive at bird feeders and will keep other birds away while feeding. One solution to keeping them away from feeders is to use Finch Feeders filled with nyjer seed. House Sparrows won't eat the nyjer seed and it's available everywhere. House Sparrows compete with many of our native bird species for nesting sites. Among the native species it competes with are Bluebirds, Tree Swallows, and Purple Martins. Where native bird species are likely to nest, every effort should be taken to control the House Sparrows attempt to nest. 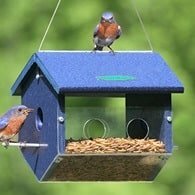 Remove nesting material quickly from Bluebird boxes and Purple Martin Houses. Once a pair has nested they will defend their nesting territory fiercly against the less aggresive and more desireable birds. This can be a daunting task as these birds are continually building nest. 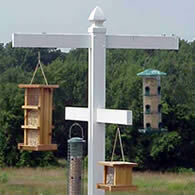 If you plan on putting Bluebird boxes or Purple Martin houses up, make sure to check them daily for nesting sparrows. If you don't have the time to monitor your birdhouses, you'll be doing more harm than good by allowing these birds to continue breeding and competing with native birds.